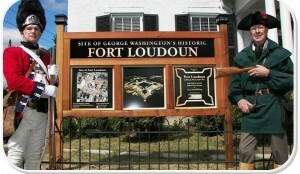 Located at 419 N. Loudoun Street, Fort Loudoun is the site of George Washington’s regimental headquarters during the French and Indian War. The only portions remaining today are the well and remnants of the bastion. On-going archaeological investigations have uncovered intact period deposits including part of the barrack’s foundation as well as numerous artifacts. The French and Indian War Foundation plans to use the c. 1850s house now located on the property as an interpretive center. In 1756, the Virginia House of Burgesses approved the construction of a chain of forts to defend the colony’s frontier. George Washington, colonel of the Virginia Regiment, was the commander responsible for protecting the back country from incursions by the French and Indian allies. Washington lobbied for a “large Magazine to supply the diverse Forts with Stores.” He chose Winchester to be that site due to its strategic location. Washington drew the plans for Fort Loudoun and supervised its construction. Built of horizontal logs filled with earth and rubble, the fort was designed with four bastions, barracks for 450 men and a well sunk 103 feet through solid limestone rock to supply the fort with water. Fort Loudoun was unmatched in size along the colonial Virginia frontier that stretched from the border of Maryland to North Carolina.